It was pouring in Mumbai when I planned my return trip to Bangalore. As always my last minute search for buses was on. However, this time one of my friend joined me in the search as he was heading towards Bangalore. With raging fever on one end and the rain filled streets of Mumbai on the other we both made our way towards Borivali. En route to Borivali, I had decided to head back home in a Sleeper as travelling in a semi-sleeper was out of question considering the situation I was in. With the demand for sleeper buses, most of the operators ply Multi Axle Volvo sleepers however choosing the right one is a tough job. With no second thoughts I decided to try VRL. 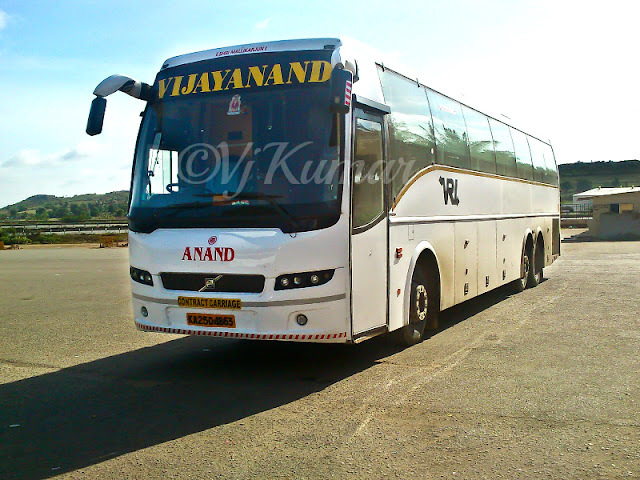 The name VRL represents comfort and safety and I was rest assured that the ride would be without surprises. I-shift Sleeper. The bus showed up at 16:50pm and I immediately boarded the bus. The interiors were done by VEERA and the maintenance and upkeep was of typical VRL standards. I along with 2 other passengers was boarding the bus at this point and no sooner we finished boarding, the bus moved. 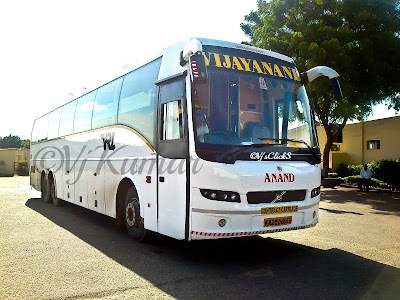 This was the first time I was travelling in a Volvo Sleeper bus, however my excitement was pretty low, all thanks to my fever. I climbed into my berth. The a/c was running on optimum however I shut them down. The berth was incredibly spacious enough and I settled down while the bus moved towards Dahisar. Each berth had an individual LCD screen with controls to switch on/off the speakers. (A much required option) We headed towards Alka Travels, Malad where we picked up few passengers and few cargos. Finally the fatigue got the better of me and I slipped into a deep sleep. When I woke up the bus was cruising towards Kalamboli. Heavy rains and Mumbai traffic had ensured the departure from Mumbai a difficult job. I headed back to sleep again and finally I was woken up by the crew when the bus reached the Food Mall on the expressway. We were accompanied by Shivneri’s and another VRL B9R heading towards Bangalore. We were the first ones to head out and while we continued towards Pune, the rains just got worse. We were constantly doing speeds of 95kmph however we were being overtaken by few B9r’s heading towards Pune and Hyderabad. I slipped back into sleep again and when I woke up we were near Pune. We picked up few passengers in Katraj and finally made our way towards our destination. We reached the VRL’s Kolhapur checkpoint at 3:30am. Here the crew change happened and again the stop was very brief. With the end of the 10th minute the driver was back in his seat and honked for passengers. We resumed our journey and headed towards Belgaum while I resumed my sleep. I briefly remember pulling up in Hubli for fuel break at around 5:30am. We were covering ground very quickly keeping comfort and speed in check. It was morning when Harihara welcomed us. We continued cruising and entered our last break for the journey, VRL’s checkpoint at Chitradurga. Though I have passed by this place on numerous occasions, this was only my second time I was entering the checkpoint. The place was empty with few trucks and a lone B9R resting. The place has ample restrooms which are very well maintained. The stop was refreshing enough and my fever had finally subsided. After a 30minute break, we got ready to depart. 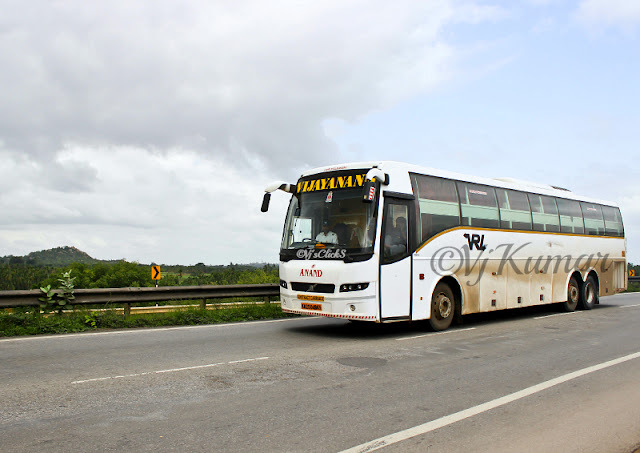 During this time Kallada-National’s B9R passed by on the highway. We resumed our journey and again we kept doing speeds of 95kmph. We quickly passed Sira and reached Tumkur bypass. Few passengers alighted at this point and we resumed our journey. SRS B11R rocketed past by on the opposite lane heading towards Ahmedabad as we headed towards Garden City. The familiar traffic filled streets of Bangalore welcomed us and we slowly made our way towards Yeswanthpur Railway station. I was dropped off at Navrang at 11:30pm. VRL is a pioneer in travel industry and their reputation as one of the best operators in the country continues to remain the same. There was no difference with the driving style of the crew as they were both driving the bus in an identical manner. Sedate driving, friendly crew and time maintenance is their USP. The bus took 18.5hrs battling rain and traffic along the route which is commendable. The service is a must try if you are a frequent traveler on Mumbai-Bangalore stretch.